TOKYO/SEOUL - Prime Minister Shinzo Abe doesn’t believe North Korea will use summits with the United States and South Korea to buy time to pursue its nuclear and missile programs, Seoul’s presidential office said Tuesday after the Japanese leader held a meeting with a South Korean envoy who met North leader Kim Jong Un earlier this month in Pyongyang. “North Korea has big negotiations to make at the intra-Korean summit and later its summit with the United States and in light of the situation I don’t think (North Korea) will use this opportunity to simply buy time,” Abe was cited as saying by the Blue House in a statement. 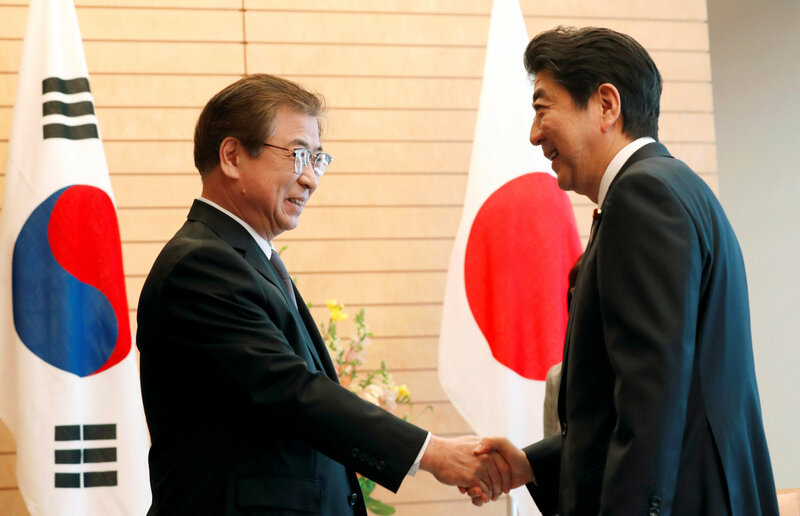 In his Tuesday meeting with Suh Hoon, director of South Korea’s National Intelligence Service, Abe reiterated his call on North Korea to take “concrete” steps toward denuclearization. “It is extremely important for North Korea to take concrete steps and implement what it has said” to move toward denuclearization, Abe said. After Suh and other delegates met Kim in Pyongyang on behalf of the South Korean president, both Moon and U.S. President Donald Trump agreed to hold bilateral summits with the North’s leader in the coming months. 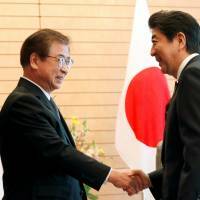 Abe also promised cooperation “in all ways possible” for the success of the envisioned summits, according to the South Korean envoy, who was visiting Tokyo to brief Japanese officials on his Pyongyang trip. Abe has said he will visit the United States early next month to hold talks with Trump to coordinate their policies on North Korea ahead of what would be the first-ever meeting between a sitting U.S. president and a North Korean leader. “I believe such a good mood began as Prime Minister Abe and U.S. Vice President (Mike) Pence attended the opening ceremony of the Pyeongchang Olympics,” he added. On Monday, Foreign Minister Taro Kono and Suh, who visited Washington after Pyongyang, agreed to work in close coordination on the issue of North Korea’s abductions of Japanese citizens decades ago. Japan has expressed its readiness to assist the process of North Korea’s denuclearization by covering the initial costs needed for the International Atomic Energy Agency to resume stalled inspections of the North’s nuclear facilities. South Korea’s National Security Office chief Chung Eui-yong, who led the delegation to Pyongyang and traveled to Washington with Suh, visited China on Monday to brief President Xi Jinping and other senior officials about the South Korean envoys’ meeting with Kim.